New peer-reviewed research finds that 30 minutes’ exposure to LTE [4G] cellphone radiation affects brain activity on both sides of the brain. In a controlled experiment, researchers exposed the right ear of 18 participants to LTE cellphone radiation for 30 minutes. The source of the radiation was 1 centimeter from the ear, and the absorbed amount of radiation in the brain was well within international (ICNIRP) cell phone legal limits. The researchers employed a double-blind, crossover, randomized and counter-balanced design to eliminate any possible study biases.The resting state brain activity of each participant was measured by magnetic resonance imaging (fMRI) at two times — after exposure to LTE microwave radiation, and after a sham exposure. The current study establishes that short-term exposure to LTE microwave radiation affects the users’ brain activity. Although LTE is too new for the long-term health consequences to have been studied, we have considerable evidence that long-term cell phone use is associated with various health risks including increased risk of head and neck cancers, sperm damage, and reproductive health consequences for offspring (i.e., ADHD). (1) Bin Lv, Zhiye Chen, Tongning Wu, Qing Shao, Duo Yan, Lin Ma, Ke Lu, Yi Xie. The alteration of spontaneous low frequency oscillations caused by acute electromagnetic fields exposure. Clinical Neurophysiology. Published online 4 September 2013. The motivation of this study is to evaluate the possible alteration of regional resting state brain activity induced by the acute radiofrequency electromagnetic field (RF-EMF) exposure (30 min) of Long Term Evolution (LTE) signal. We designed a controllable near-field LTE RF-EMF exposure environment. Eighteen subjects participated in a double-blind, crossover, randomized and counterbalanced experiment including two sessions (real and sham exposure). The radiation source was close to the right ear. Then the resting state fMRI signals of human brain were collected before and after the exposure in both sessions. We measured the amplitude of low frequency fluctuation (ALFF) and fractional ALFF (fALFF) to characterize the spontaneous brain activity. We found the decreased ALFF value around in left superior temporal gyrus, left middle temporal gyrus, right superior temporal gyrus, right medial frontal gyrus and right paracentral lobule after the real exposure. And the decreased fALFF value was also detected in right medial frontal gyrus and right paracentral lobule. The study provided the evidences that 30 min LTE RF-EMF exposure modulated the spontaneous low frequency fluctuations in some brain regions. With resting state fMRI, we found the alteration of spontaneous low frequency fluctuations induced by the acute LTE RF-EMF exposure. (2) Volkow ND, Tomasi D, Wang GJ, Vaska P, Fowler JS, Telang F, Alexoff D, Logan J, Wong C. Effects of cell phone radiofrequency signal exposure on brain glucose metabolism. JAMA. 2011 Feb 23;305(8):808-13. doi: 10.1001/jama.2011.186. The dramatic increase in use of cellular telephones has generated concern about possible negative effects of radiofrequency signals delivered to the brain. However, whether acute cell phone exposure affects the human brain is unclear. To evaluate if acute cell phone exposure affects brain glucose metabolism, a marker of brain activity. Randomized crossover study conducted between January 1 and December 31, 2009, at a single US laboratory among 47 healthy participants recruited from the community. 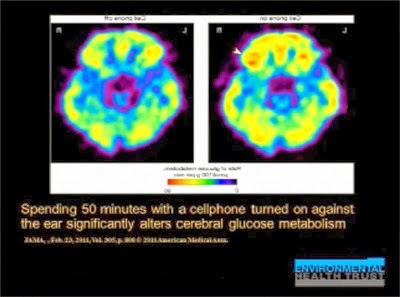 Cell phones were placed on the left and right ears and positron emission tomography with ((18)F) fluorodeoxyglucose injection was used to measure brain glucose metabolism twice, once with the right cell phone activated (sound muted) for 50 minutes (“on” condition) and once with both cell phones deactivated (“off” condition). Statistical parametric mapping was used to compare metabolism between on and off conditions using paired t tests, and Pearson linear correlations were used to verify the association of metabolism and estimated amplitude of radiofrequency-modulated electromagnetic waves emitted by the cell phone. Clusters with at least 1000 voxels (volume >8 cm(3)) and P < .05 (corrected for multiple comparisons) were considered significant. Brain glucose metabolism computed as absolute metabolism (μmol/100 g per minute) and as normalized metabolism (region/whole brain). Whole-brain metabolism did not differ between on and off conditions. In contrast, metabolism in the region closest to the antenna (orbitofrontal cortex and temporal pole) was significantly higher for on than off conditions (35.7 vs 33.3 μmol/100 g per minute; mean difference, 2.4 [95% confidence interval, 0.67-4.2]; P = .004). The increases were significantly correlated with the estimated electromagnetic field amplitudes both for absolute metabolism (R = 0.95, P < .001) and normalized metabolism (R = 0.89; P < .001). In healthy participants and compared with no exposure, 50-minute cell phone exposure was associated with increased brain glucose metabolism in the region closest to the antenna. This finding is of unknown clinical significance.